Keeping fit and healthy during the cold winter months is often a challenge. 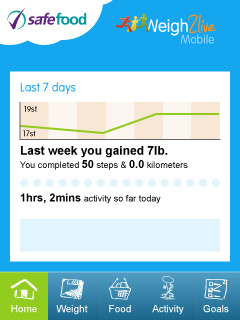 For help managing your weight and fitness we have just launched a mobile app for weigh2live. weigh2live.eu is an independent website, developed by nutritionists from safefood and dietitians from the Irish Nutrition and Dietetic Institute. Our handy mobile app allows you to keep track of your diet and fitness, your daily activities and your weight and fitness goals. It is extremly user friendly, with an inviting user interface and quirky, welcoming design. We have loved working with safefood on the weigh2live project, developing their new site and now the mobile app. Sign up here to keep motivated or use the handy mobile app on the go. Why not get involved by joining a group and find support and advice on Facebook.